Plastic is the most common and widely accessible raw material used in 3D printing. It is used by both industrial and consumer markets. Because of its efficiency, plastic is also the leading material used in the 3D printing industry. Nowadays, there is a wide range of choices for 3D printing plastics that are available in the market. It can be challenging for engineers and designers to choose which kind of plastic material is suitable for a certain project. C-Mac Industries is here to help! We offer the custom plastic 3d printing service in Sydney and can provide you with high quality 3d printed plastic parts and products with short lead time and competitive price. Why use plastic for 3D printing? One of the biggest advantages of 3D printing with plastic is its cost. Plastics are more affordable than any other type of 3D printing materials. Moreover, it is also easy to make prototypes and make iterations out of it. 3D printing with plastic is applicable in various industries. For instance, 3D printed parts can be used to create medical tools or even 3D models of organs. Moreover, it can also be used in automotive industry for car parts replacement. 3D plastic parts are also used for aerospace industry and architecture. ABS is a common type of plastic material being used in different industries that include automotive components, manufacturing of pipes, protective gears, kitchen appliance, etc. It is one of the popular plastic materials used in industrial 3D printing. This material is generally durable and strong. It is also popular because it is inexpensive with good mechanical properties. It is also slightly flexible and relatively resistant to heat. PLA is also a popular plastic filament aside from ABS. it is the best choice for most extrusion-based 3D printers since it can work seamlessly with low temperature and doesn’t require a heated bed. PLA materials are also widely used because it is easy to print with. One of the distinct characteristics of PLA is that it doesn’t warp easily. It also does not give off any foul smell during printing. ASA was originally developed to be a weather resistant material. Therefore, it is primarily used in automotive industry. In addition, ASA is strong, rigid and easy to print with. This plastic material is the best alternative to ABS materials. It is known for its high impact resistance and high temperature resistance. Conversely, ASA has also its printability drawbacks such as warping issues and emission of hazardous fumes dues to the presence of Styrene. PET is a raw material that is rarely used in 3D printing. There are some variations of this material which includes PETE, PETG and PETT. PET material is known as the polymer used in water bottles and also found in clothing fibres and food containers. It is semi-rigid and has good impact resistance. This material has also great thermal characteristics and adheres well to the bed with negligible warping. PC is known to be the strongest plastic filament used for 3D printing. It is also resistant to physical impact and heat. Moreover, it can able to withstand a temperature of up to 110°C. It is commonly transparent and used mainly for items such as bulletproof glass, scuba masks, etc. It is also extremely hygroscopic and should be stored in moisture-free and airtight containers. Nylon is a well-known family of synthetic polymers that are generally used in different industrial applications. Additionally, it is also popular for its flexibility, strength and durability. One distinct feature of nylon is it can be dyed according to the preferred colour. However, nylon is hygroscopic. This means that this material absorbs moisture and needs to be kept in a cool and dry place. PVA is another type of plastic that is soluble in water. However, since it can be dissolved in water, extra care and attention are needed when storing it. In 3D printing, PVA is not used to make a finished product but rather used to create support structure. Furthermore, PVA has good thermal stability. It is biodegradable with no harmful by-products. FDM – FDM is popular for using plastic materials in 3D printing. These plastic materials are usually in a form of filament spool. SLA – For SLA, photosensitive liquid resins are used to manufacture 3D parts. These resins are also divided into 2 categories which are thermoplastics and thermo-solids. PolyJet – The same with SLA, PolyJet also uses a liquid form of plastic to print. SLS – This printing technology uses plastic powder materials to manufacture 3D parts. This method uses a laser to fuse plastic powders layer by layer to create the object. If you are inexperienced in terms of 3d printing, you are recommended to read this 3d printing guide. Have demand in 3d printing custom plastic parts in Sydney? Look no further! C-Mac, as a leading 3D printing service provider in Sydney. We are not only providing 3D modelling services, mechanical design and drafting services in-house, but also other related 3D printing assistance and advices. "I chose to engage C-Mac originally because of their experience with metal work and ability to provide design solutions; though in the end it was all plastic and exceeded my expectations. The team at C-Mac suggested we use 3D printing and at first I was unsure - plastic, easier, strong...were all my questions. When I picked up the finished design, it delivered. 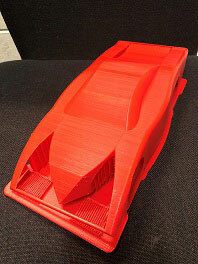 I would definitely encourage someone for 3D printing for early design testing and the C-Mac team did an excellent job! Thank you!" Why choose C-Mac as your plastic 3d printing solution supplier? Quality plastic 3d printed parts with high accuracy is achievable. The 3d printing job will be cost efficient due to C-Mac's best practice in lean manufacture. In-house experienced and skilled 3d designer and 3d printing engineers in Sydney Australia who strive for customer satisfaction. 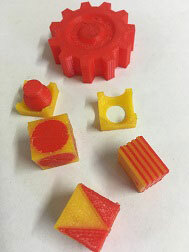 Competent to 3d print different parts in multi-colours, multi-materials at the same time. Advanced 3d printers and powerful 3d printing software in use for process monitoring and quality control - You job are in safe hands! Short turnaround time is always one of C-Mac industries competitive advantages.